Drought can be classified as an extreme weather catastrophe that is becoming increasingly important in recent years due to climate change. It is caused by a persistent shortage of precipitation and agriculture is one of the most affected sectors. In fact, agricultural drought occurs when there is not enough soil moisture to support crop production, resulting in a reduction of it and substantial economic losses. For this reason, soil moisture is commonly used in the scientific community to obtain drought indices which are key-tools to quantify various drought parameters such as intensity, frequency, severity and spatial extent. How can remote sensing help in monitoring droughts? The main limitations of traditional ground-based soil moisture measurements are given by the point-based nature of soil moisture time series and by the limited spatial coverage on a global scale, in particular in developing countries. The latter are the most affected by the catastrophic effects of drought. The use of synoptic, timely and spatially continuous remote sensing soil moisture data from active and passive microwave sensors may be regarded as the best solution for the evaluation of drought conditions in large areas where soil monitoring tools are scarce or even non-existent. Thanks to the work of Dorigo et al. (2017) this is now possible. The European Space Agency (ESA) – Climate Change Initiative (CCI) Soil Moisture product merges active and passive products in a coherent long-term time series of soil moisture (from 1978 on) which is precious for drought studies. 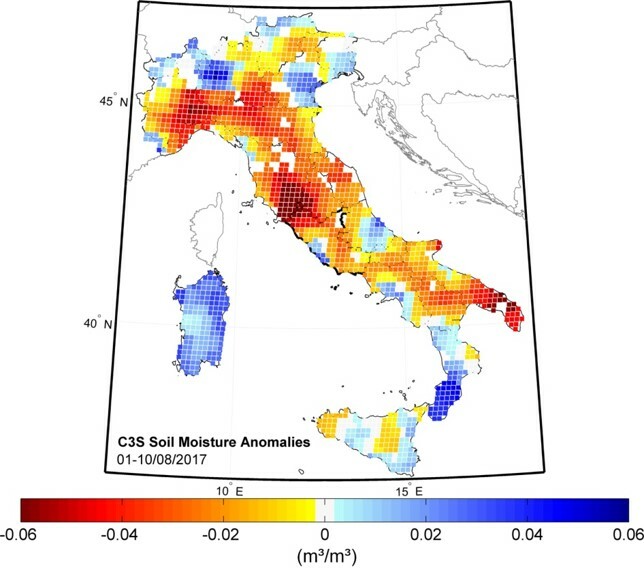 For instance, satellite data on soil moisture (August 2017) show that soils in southern Tuscany have been drier than normal (red colours). Even though drier than normal conditions occur regularly, the current situation is uniquely intense and persistent, similar to the droughts in 2007 and 2012. Hydrology-Irpi is currently using the ESA CCI soil moisture product to obtain the Standardized Soil Moisture Index (SSI), in collaboration with the International Water Management Institute (IWMI) of Sri Lanka, for the assessment and monitoring of agricultural drought in India. Starting from the Standardized Precipitation Index (SPI, McKee et al., 1993) many standardized indices have been developed, using different variables instead of precipitation and they are currently the most commonly used statistically-based indices for drought assessment. Considering the importance to have access to long time series of soil moisture for SSI calculation, ESA CCI soil moisture product is currently the most suitable remote sensing product for drought analysis from an agricultural point of view. We tested SSI in India, where the population depends primarily on the agriculture for its livelihood. 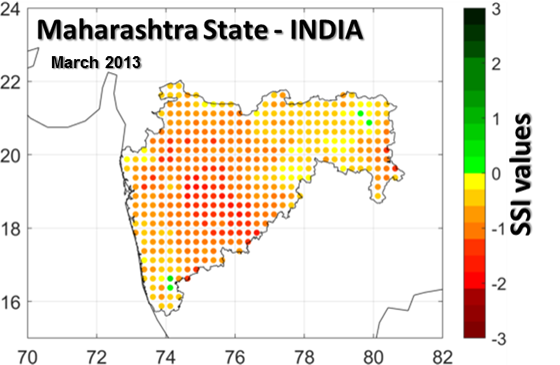 The Figure below shows an extended drought event at the beginning of 2013, accurately detected by SSI (SSI <0, red colours), during which main parts of Maharashtra State have been affected by drought. The aforementioned drought event, can be identified in time by inspecting the SSI time series averaged over Maharashtra State and shown in the following. As can be noted, the drought event, started in October 2012 and ended in May 2013. How is Hydrology-Irpi validating SSI? Hydrology-Irpi is currently evaluating the potential of SSI index testing it against agricultural productivity in the Districts of Maharashtra and Karnataka States in India. Crop yield data were provided by IWMI from 1998 to 2015 and considered as a proxy for agricultural drought phenomena. This is the starting point to test the performance of a remote sensing product used for drought assessment. The following Figure shows results for a Pearson correlation analysis over the Districts of the study area between the time series of maize anomalies and SSI time series. The satellite soil moisture dataset gave positive results with 26 Districts over a total of 51 with positive Pearson coefficient values higher or equal to 0.5. Click here to download the presentation for the 16th Plinius Conference on Mediterranean Risks at Montpellier, France, 9–11 October 2018.